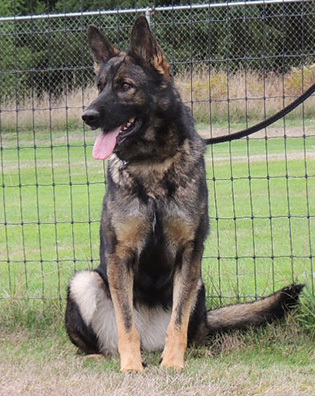 A lovely female of our own breeding and produced here at Schraderhaus K9, Porsche is a highly intelligent female of excellent temperament and we are pleased to include this female as an important component to our breeding program. 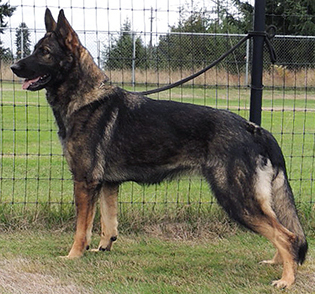 She is 100% Pure East German lineage, and adds much to our breeding program by way of contributing an excellent hip and elbow background from both sides of her parents, including that of herself having received an OFA Rating for hips of OFA EXCELLENT. 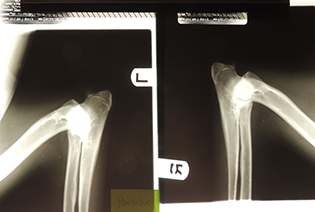 Porsche has excellent health and a very strong immune system against illness. 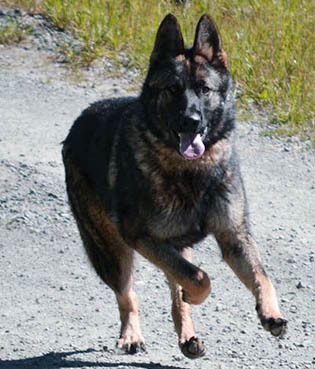 Porsche's Dam: Porsche is an energetic and lively pure DDR female out of our DDR Import,Dany vom Grafental. Like her mother, Porsche has very good hunt drive, food drive, and is friendly and confident in nature, and is an extremely agile and athletic female. 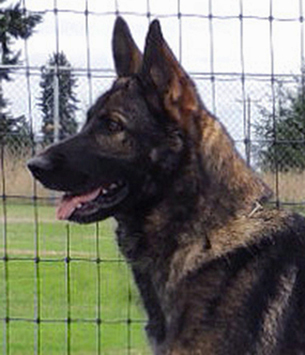 She is a gorgeous black sable with good substance, and a beautiful DDR type head and dark pigment. Porsche is a well proportioned female with very nice correct topline and underline, substantial bone and lovely expression with dark eyes. Her expression, character and head type is super and is typical of what we like to see from the the DDR dogs. 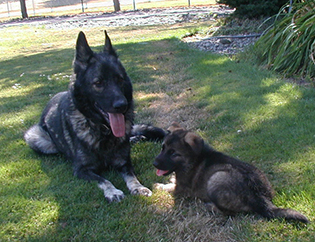 She has an outgoing and free temperament, and is accepting of other animals, and kind with children and is an excellent mother with her pups. 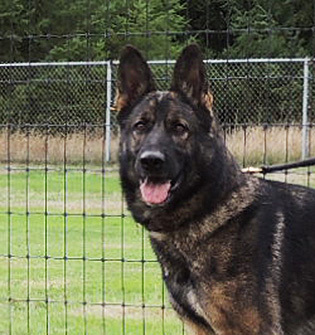 She shows very good natural suspicion and protection instinct, and has exceptional scenting abilities making her an excellent choice for pups which will be suitable for Family protection, S & R and Therapy Dogs as well as for Schutzhund Sport. 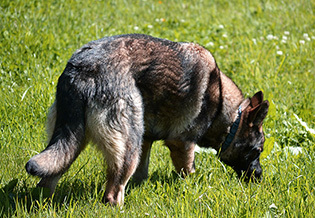 Porsche's Sire, Ivo von Hauental, is an exhuberant, strong and substantial black sable male with masculine and strong head typical of the East German / DDR Dogs. 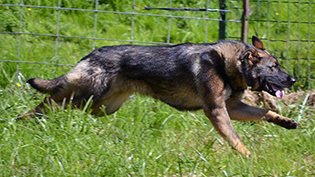 Possessing a 100% East German Pedigree, Ivo received his Sch 3 at just over 2 years of age. He received his V Rating at just over age 26 mos. Ivo has an excellent disposition and work ethic with a very strong herding instinct which he has possed along to his pups. His pups possess his spirit of kindness and exhibit his excitement for the ball and excellent deep nose for tracking along with good protection skills, and sure and stable temperaments. 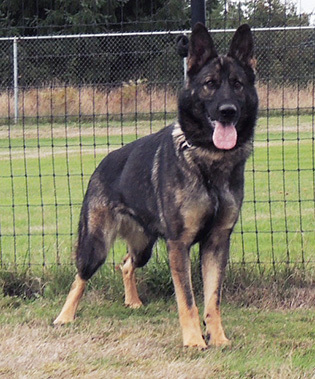 Deep pigment of coats will be outstanding in his pups, as well as his beautiful head type and athletic body structure that he passes along into his offspring. a combination of outstanding structure and temperament.